My husband, Jon, is a snacker. 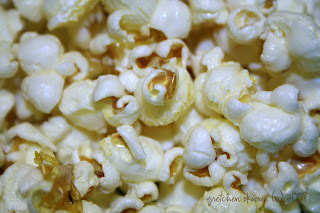 His pretzel habit had to be cut back so he rediscovered his love of popcorn and insisted I post it on the blog. He claims he has mastered the fine art of popping corn on the stove. (yes, you are allowed to chuckle to yourself...I did.) We don't own a microwave, in case you were wondering why he goes to all this trouble. In a cold pan pour just enough canola oil to cover the bottom, drop a single kernel and crank the heat to high and cover. Everything happens quickly so sit tight and wait. Once that kernel pops, pour in enough kernels to cover the bottom of the pan, no deeper than one layer otherwise the bottom layer will burn. Listen for the pops. Once they are fast and hard , remove from heat and do a little shake. With the pot! Pour into a bowl and let cool. An inexpensive snack. $1.50 vs $30 a month pretzel habit. If you put in a sealed airtight container, the popcorn will remain fresh for a few days.